We are looking for contributors of original writing, including editiorials, humorous essays, satire, short stories, and music reviews. Click here for more info. Hello, Becky Sue here. I have been invited by Somebody, as he is known, to write an editorial for his website. He is my co-worker at Bitchin' Baskets and an expert gift basket arranger. I suppose the reason for his invitation is that he knows I am a news junkie and very outspoken on political issues, and I also helped to campaign for Hillary during the 2016 election. He said his site is in dire need of a new editorial and his usual writers have shied away from contributing in the politically volatile climate of recent times. I have done a little bit of blogging before, but haven't had much experience with writing editorials, so I am honored by this opportunity. Well, here it goes, so buckle up your seat belts. The country seems to be in a state of complete insanity these days. We have an out-of-control narcissist president, hostility between political factions, disastrous weather events, mass shootings, immigration hysteria, geo-political tensions with Russia and other countries, a crashing stock market, and the list goes on. These things are cause for great concern for any aware person. Like many people, I'm concerned about the erratic and unexplainable behavior of our current president, Donald Trump. For instance, he would rather shut down the government than compromise with the Democrats. He won't listen to members of his own party or even his own advisors. Trump should get his ego under control and admit that someone else besides him might possibly know something. His cabinet has been like a game of musical chairs. Just last month he dumped his Secretary of Defense, James Mattis (right before Christmas, if you can believe it). Mr. Trump doesn't like to be told what to do, so he tends to reject much of the advice he receives, and that seems very immature. Then again, these qualities are seen by his supporters as signs of strong and decisive leadership. They continue to believe he is draining the swamp and making America great again. The biggest controversy of the Trump presidency, of course, is the border security issue (or non-issue, depending which side you are on). While I agree that having completely open borders would not be a wise policy, there are more reasonable and effective ways to handle the immigration situation than building a wall. Most of these migrants, documented or not, want nothing except to find work and feed their families. Have a little heart, you alt-righters. I'm pretty sure most of you are descended from immigrants too. Somebody has pointed out to me that Trump's wall is also unnecessary because a 700 mile border fence was constructed during Obama's presidency. That was surprising information, and it further illustrates the pointlessness of Trump's plan. Instead of a large and imposing wall that sends the wrong message to immigrants, the current fence performs the same function without the political posturing and wasteful spending. It points aspiring border crossers in the direction of becoming legal citizens instead of undocumented migrants who might be exploited for low wages and denied various benefits by unscrupulous employers. I didn't want to make this editorial only about Trump, but let's be honest, he is America's biggest problem right now. His foreign policy blunders are even scarier than his domestic agenda. His disrespectful treatment of his military advisors and the intelligence community has put the country's security at risk. For example, his recent decision to withdraw US troops from Syria will surely lead to an increased terrorist presence there even though Trump claims ISIS has been defeated. We all know once the troops are gone, the ruthless dictator Assad will allow the terrorists back into the country to torment his people again. But Trump doesn't care about the Syrians, he only cares about putting America first, whatever that means. Now is not the time for isolationism. If we don't fight them over there, we'll have to fight them here. That's a quote from somebody, I don't remember who at the moment. Dealing with climate change, of course, is another concern of many people, including myself. However, we should steer clear of excessive alarmism on this issue. Scientists still aren't sure that "extreme" weather events like hurricanes and droughts are due to global warming. Natural fluctuations in weather patterns, such as El Niño, could be making things seem worse than they really are. Anyway, the country was moving in the right direction with clean energy development under Obama's sensible "all of the above" energy policy, and we surely would have had climate change under control by now if the Orange Menace had not withdrawn the US from the Paris Agreement. Lucky for us and the planet, the Democrats won back the House in 2018 and their enthusiastic commitment to bipartisanship will hopefully restore America's status as an environmental leader. Healthcare is another big issue these days, with ever-rising premiums and stingy insurance companies putting the squeeze on Americans' bank accounts. Democrats are struggling to preserve what's left of the Affordable Care Act (aka Obamacare) after the individual mandate was repealed by the latest tax bill legislation in December. However, some in the GOP are now admitting that the part about not denying coverage based on pre-existing conditions was actually a good idea, so that could be considered a step back in the right direction for us ACA fans. Then there are those (mostly Bernie Sanders supporters) who favor "Medicare For All," a universal health care plan which sounds nice in theory, but many prominent think tank commentators say it is dangerous and could lead to a loss of jobs in the health insurance industry and destabilize our economy. So we're probably better off sticking with the old tried and true market-based healthcare for now. 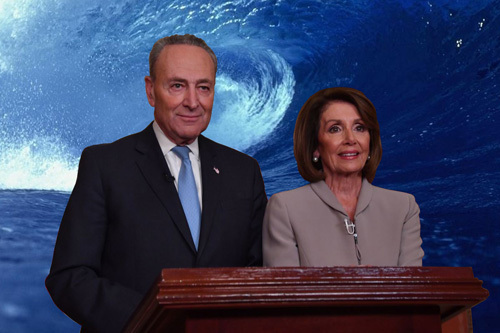 In summary, we appear to be on the right track to a better future, not only because Trump's presidency is halfway over with, but also because of the new spirit of cautious optimism dawning over the nation thanks to the blue wave that swept into Congress last November. Democrats are gearing up to break the gridlock in Washington in 2019 and get things done. There is no need to make America great again, we are still the greatest country on earth except for a certain problem in the White House.